Raw Denim & Selvedge American Jeans Brooklyn | Williamsburg Garment Co.
Small batch, better denim brands often make jeans in long inseams in order to cover a wide range of buyers. Simply hemming the jeans may do the job cutting them down from jeans that fit a 6’2 guy to a 5’8 fellow. However, what do you give up when the leg contour of a 36-inseam is cut down to a 28-inch inseam? Answer: a baggy knee area. Unless you also shift the knee placement up with tapering, a short person’s knee would be swimming around in the thigh area of jeans initially designed for someone taller. Learn how to add tapering to reposition the knee for optimal fit. 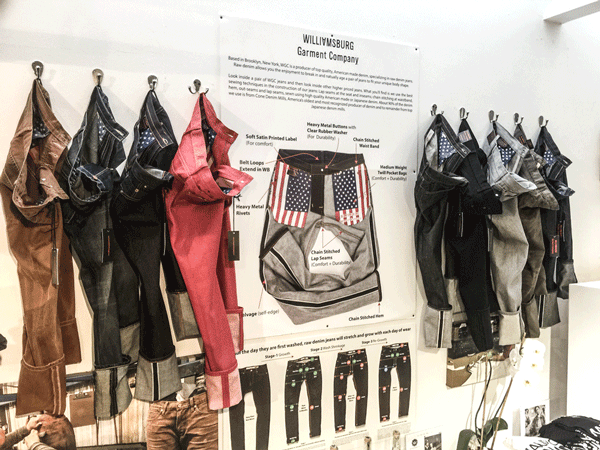 Williamsburg Garment Company is Brooklyn, New York’s home for raw denim American made jeans. We specialize in Made in USA denim, Japanese and Italian selvedge raw jeans, but also offer clean sober vintage inspired washes for both men and women, as well as the highest quality big and tall jeans on the planet. Fits are named after streets located in the Brooklyn neighborhood of Williamsburg, to represent the pride the designer has for his hometown. Men’s jeans are given street names, while Avenues are used for women’s jeans. We take pride in writing enlightening and informative articles for both beginners and denim enthusiasts. Learn about shrinkage, stretching, growth, alterations and caring for jeans. Fit guides review and compare the differences between ours and other denim brand and styles. Shop online or in-store for denim, repairs and professional alterations services.